The last part is maybe the most important part: automation! In the good old days (and still today), an update of an application is done by deploying new files to the webserver. To maintain strong versioning in most cases full sites are deployed when actually only a single file was changed. The downside of all of this is that the deployments are heavy, contains lots of files and often involves some processing before the actual deployment begins. For example, to prevent orphaned configurations or assemblies, all configurations and assemblies are removed first before a new deployment starts. Deployments are just no fun, it’s hard working and is hard to automate. However, the idea is correct, always deploy a full version of an application. Kubernetes is taking the same idea but it’s using a single image instead of 25.000 files. And because we are dealing with images we do not need to process all these files. 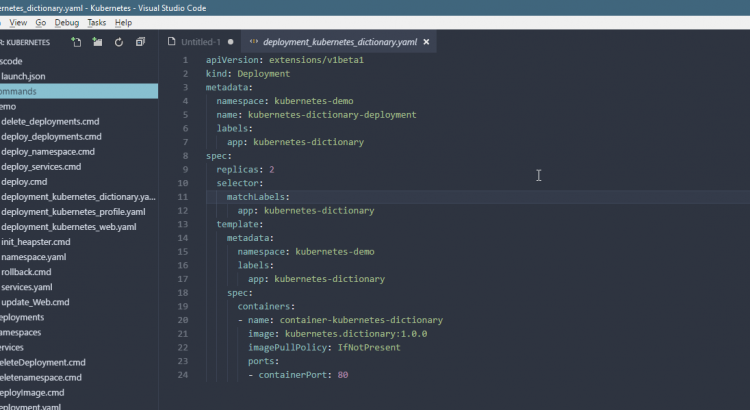 An update within Kubernetes is done by changing a deployment file or by telling Kubernetes that a container in a pod must use an other image of tag. A Deployment’s rollout is triggered if and only if the Deployment’s pod template (that is, .spec.template) is changed. Now, something interesting is happening. For our setup, we are using only 6 pods (2 pods per app/api). Kubernetes is setup to only replace pods if a new pod is operational. So, in our case a new pod is created first before the existing pod is updated(replaced). This can be seen in the Kubernetes dashboard where you’ll see 7 pods for a few seconds. When the new pod is running, the old pods will be removed and be replaced by new pods with the new image. No downtime! All managed by Kubernetes. In this are there is still lots to learn and there is quite some interesting stuff to learn. Think about auto-scaler where it is possible to scale pods horizontally when the load is above 80% using a minimum of 10 pods with a maximum of 20 pods. Sounds cool huh! Recreate is the most basic strategy. Using this strategy will stop all running containers using this image and recreate the image. Rolling update, this is done in our example, a new pod will be created and other pods will follow after. So this is just a normal update. It starts and rolls out the update one after the other. Blue Green deployment is done by setting up a full new temporary environment, so all Pods are duplicated using the new version. When all Pods are ready, the service is updated and will point to the new version. Canary deployment is actually using multiple active sets of Pods. Based upon the results of the new version it is possible to ramp up the number of new Pods and scale down the number of Pods using the older version. This is mostly done when testing new features which are tested by a subset of users only. This will remove all pods defined in this file, which is the profile-api in this case.